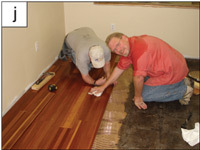 These instructions cover installation methods for flooring applied over concrete slabs. 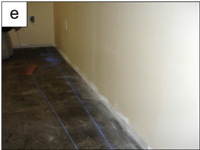 The recommended application to an aged concrete slab is to glue (Urethane adhesive only) flooring directly to the slab surface. 1. Select a starter wall. An outside wall is best; it is more likely to be straight and square with the room. 5. Most walls are not straight so set the flooring to the chalk line for straightness, remembering to allow 13mm (approx 1/2″) gap along wall for expansion. 6. Install the first row of starter planks (flooring groove should be facing the starter wall) and secure into position. Proper alignment is critical. 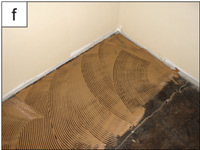 Misaligned starter rows can ruin your installation. 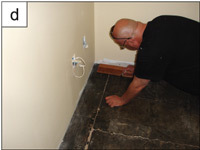 Professional installers sometimes firmly secure a straight edge along the chalk line (2x4’s work well), as a guide and to prevent planks from shifting in wet adhesive. 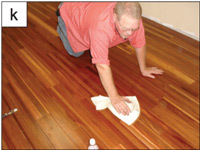 Other installers prefer to install a few rows of flooring precisely laid straight, then allow to dry for several hours before proceeding. 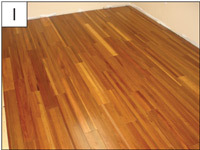 (be sure to scrape excess glue from the subfloor so that excess dried glue doesn't hinder installation of the remaining floor.) 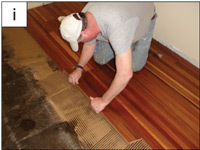 This method allows for a solid racking of the flooring for tightness without moving your starter rows around. 7. Use a scrap wooden tapping block to tap the planks until the tongue and groove snaps into place. 10. After several rows of planks are installed, lay down perpendicular strips of masking tape (blue painters tape) to help hold the planks securely while the glue cures. Repeat this process as the installation progresses. 12. 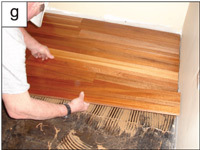 Retain a few planks in case a repair is ever required.